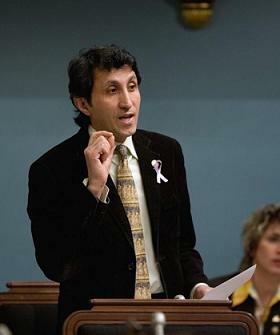 Roger Rashi is a founding member of Québec Solidaire and presently sits on the party’s Commission on the environment. He is also a member of Masse critique, a recognized anti-capitalist and ecosocialist collective within Québec Solidaire. 1. See “Sondage Léger Marketing. Le Devoir-The Gazette. Le PQ maintient son avance,” Le Devoir, June 14th 2010. 2. See “PQ severs ties to SPQ libre,” The Gazette, March 15th 2010. 3. See “Le PQ montre la porte au SPQ Libre,” Radio Canada, March 15th 2010. 4. See “Quebec politician posts bail for Jaggi Singh,” CBC July 13th 2010. 5. See: Québec Solidaire “Pour une société solidaire et écologique. Cahier de participation au programme. Enjeu 2,” June 2010, p. 5. 6. See: François Cyr and Pierre Beaudet, “Québec solidaire doit rester une coalition arc-en-ciel”, Les Nouveaux Cahiers du socialisme, June 15th 2010. 7. See: Roger Rashi: “Québec solidaire: vers un parti anticapitaliste s’inscrivant dans un large mouvement de lutte au néolibéralisme,” Les Nouveaux Cahiers du socialisme, August 13th 2010. 8. See Sean Mills highly informative account of 1960s radicalism in Quebec: The Empire Within, Montreal: McGill-Queens University Press, 2010; and Jean-Philippe Warren’s essay on Quebec’s Marxist-Leninist movement of the 1970s: Ils voulaient changer le monde. Le militantisme marxiste-léniniste au Québec, Montreal:VLB éditeur, 2007. Mills judged Montreal to have been in the 1970s “a Maoist centre unmatched elsewhere in North America” (p. 210). While Warren opines that two main Marxist-Leninist (Maoist) organizations “dominated the Quebec left for 7 to 8 years in the 1970s grouping thousands of members and sympathizers to the point where they became the most important left trend in the post-war era” (p. 16). Both organizations, In Struggle (En Lutte) and the Workers Communist Party (Parti communiste ouvrier), dissolved in the early 1980s.